Donald Trump owes his election to former Obama supporters distressed by the economic decline of their communities. Trump was able to channel this concern, particularly in rural and smaller urban areas, into a promise to reverse globalization. Mainstream economics has long accepted the proposition that trade benefits both parties. But even if society as a whole benefits, the gains are not evenly distributed; trade makes winners and losers. Those whose jobs were lost to cheaper imports will not be impressed by arguments that the society as a whole is better off. Branko Milanovic, formerly chief economist for the World Bank, analyzed the change in global income over 20 years as compared to people’s income at the start of the period. He found that most of the gains in income were enjoyed by two groups of people: (1)those who moved into the middle class in emerging third world countries, such as China, Vietnam, India, and Indonesia and (2)the super-rich. 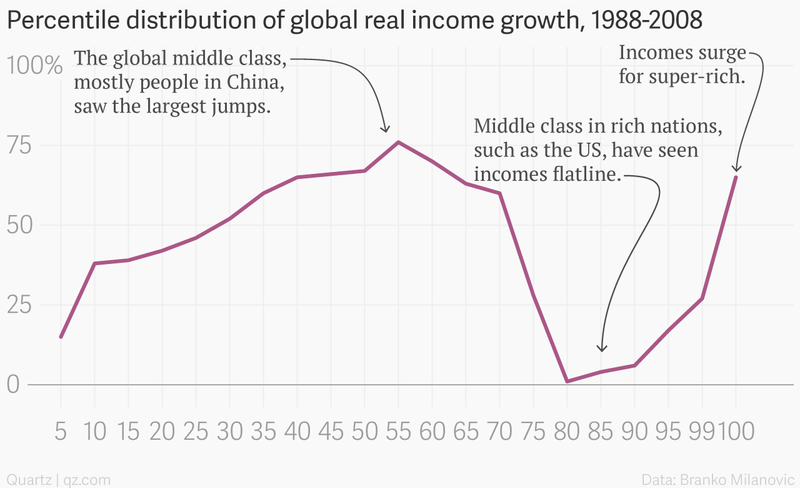 By contrast middle class people in the US, Europe, and other rich countries saw little gain. The resulting graph (taken from Quartz) sometimes called the “elephant chart” because of its shape, is shown below. Analyzing outcomes from the 2002 and 2010 congressional elections, we detect an ideological realignment that is centered in trade-exposed local labor markets and that commences prior to the divisive 2016 U.S. presidential election. A counterfactual study of closely contested states suggests that Michigan, Wisconsin, Pennsylvania and North Carolina would have elected the Democrat instead of the Republican candidate if, ceteris paribus, the growth in Chinese import penetration had been 50 percent lower than the actual growth during the period of analysis. The Democrat candidate would also have obtained a majority in the electoral college in this counterfactual scenario. Other economists argue that automation has had a much larger role than China in destroying jobs. They point out that, contrary to Trump’s claims, US industrial output has increased even as employment has declined over many years. One reason many smaller towns are in trouble is that they were originally established to serve the needs of farmers. But technology has allowed farms to employ far fewer people while increasing their output. Farms have grown bigger and more mechanized, becoming multi-million dollar businesses. Towns, built to serve the surrounding farming community, find they no longer have the customer base they need, resulting in the loss of businesses, their school, and ultimately many of their young people. It is likely technology will continue to destroy jobs. For example, think of the push to develop self-driving vehicles. One labor market growth area recently has been for truck drivers. If self-driving trucks become viable, what happens to this market? Regarding economics, if you haven’t read Ayn Rand lately, I suggest that you do as her books pretty well capture the mindset. This new administration hates weak, unproductive, socialist people and policies, and it admires strong, can-do, profit makers. It wants to, and probably will, shift the environment from one that makes profit makers villains with limited power to one that makes them heroes with significant power. Diulio should know the type. The founder of the Bridgewater money management firm, he is a multi-billionaire himself. The Trump supporters were remarkably loyal to Trump, and willing to overlook the many risks that came with his election. Following Trump’s victory, there was a spate of articles profiling Trump voters panicked that they would lose their health insurance through Obamacare. They seemed to be hoping that, in this case, Trump didn’t mean what he said. That’s not the only area where the Trump victory represents a potential threat to the welfare of his supporters. Although he promised to protect Social Security and Medicare, that has not stopped him from appointing people who have a long record of advocating cuts to these programs. And the Medicaid expansion that came with Obamacare is another example of a program whose ending would disproportionately affect areas that supported Trump. Why were the Trump supporters willing to overlook these threats to their welfare? My guess is that Trump’s promise to crack down on Chinese imports dominated every other consideration for his supporters. From their viewpoint, they have a deal: Trump will follow through on his promise to crack down on Chinese imports. Trump’s ability to read audiences and say what they want to hear makes it hard to predict what policies his administration will follow on most issues. However, to back out of the promised crack-down on Chinese imports would be especially costly because it would be a betrayal of his supporters. Thus, it seems safe to assume there will be a turn to protectionism. One plan under consideration by the Trump team is an across-the-board 10 percent tariff on imports. Presumably many of our trading partners would apply similar tariffs on imports from America. As a result, America would likely import less, but also export less. Another approach tries to be more selective. Particular imports from China might be targeted—for examples, browse the shelves of Walmart. The Chinese in turn are likely to put tariffs on selective American products—such as airplanes from Boeing—where China is a rich market for the U.S. The US Census Bureau issues annual reports on exports and imports for each state. 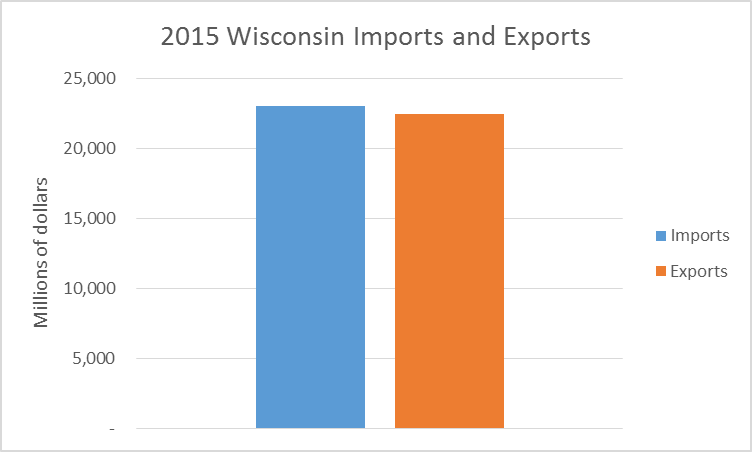 For Wisconsin the two are in rough balance, as shown below. The Census Bureau also lists the 25 top trading partners. As shown below, the top three for both imports and exports are China, Canada, and Mexico (the numbers on the bars show the rank), although China exports a lot more than it buys and Canada imports well more than it sells. The bureau also lists the top 25 products exported and imported. Here, the lists are quite different. 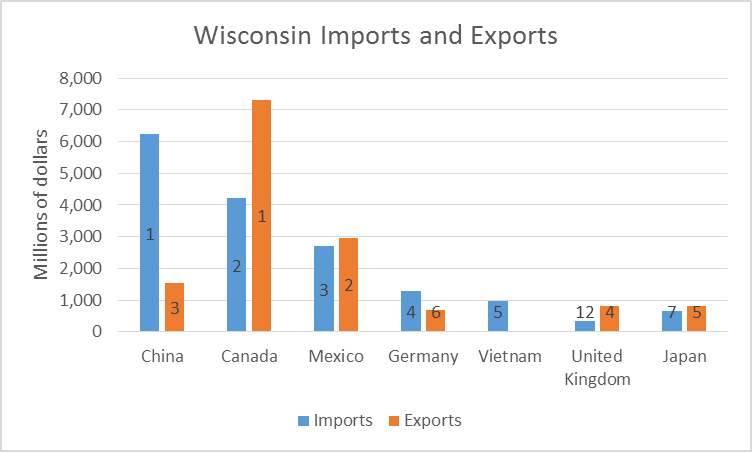 Wisconsin’s exports are heavy on mechanical equipment (although the top export is adrenal cortical hormones). By contrast, many of the imports are things likely to show up in Wal-Mart. About a quarter of the value of the top 25 imports are clothing, fabrics, and footwear. Wisconsinites could be paying more for these items while its manufacturers lose business in China. Could that hurt manufacturing employment here? But it’s not that simple. A number of the items on both lists are parts likely to be incorporated into other products. Thus a tariff could make a variety of American and Chinese products less competitive. Increased world trade has disrupted many communities as supply chains are continually redesigned. Trying to undo globalization could be equally disruptive, redesigning supply chains once again. Some firms—and their employees—will benefit; others will lose out. Trying to target protectionism so that only workers in some states benefit (say, Rust Belt economies of Michigan, Wisconsin, Pennsylvania and Ohio) could be very difficult to do. And even if it could, it opens the door to complaints from other states. 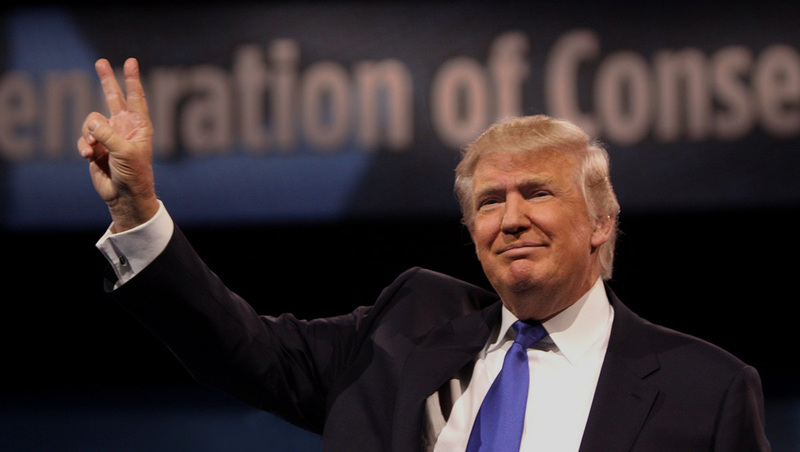 Politically, in my view, Trump has to follow through on his commitment to reverse globalization. The result, however, seems unlikely to benefit those who put their faith in him. More broadly, the administration that is emerging is one that shows remarkable disdain for the people who put them in power. Ayn Rand cheap shot, really. The Trumpist are with out compassion. How do you solve the crisis in social security disability. Under Obama, our country went from 5 million on disability to 10 million as Obama leaves office. As a liberal Bruce Thompson you suggest it can not be reformed. To do so would be heartless, so since the disability funding is insolvent it seems we just combine the problem with another insolvent problem, Social Security. 12.5 percent of every worker’s check in America goes to Social Security and still the program is insolvent. The liberal argument is always more taxation on the working people because that is compassion. Tell that to the veterans promised reliable and speedy government health care at the Veterans Affairs hospitals. Is it a cheap shot because it’s true and the truth hurts? Liberals are always calling for an increase on taxes for working people? That isn’t true at all. They are calling for more taxes on the rich. Vince I hope part of your dream comes true. California has a 13 6 percent state tax on the wealthy and a 7.5 percent sales tax. I hope the weak and unproductive keep voting to push businesses and citizens out of that utopia. You should check the definition of “insolvent” before continuing to throw that word around. “Insolvent” implies a present condition, which is not a true statement for Social Security. One of its synonyms, “overleveraged”, is probably more appropriate, but oh-so-less-headline-y. The “cheap shot” is actually in Jason’s response, trying to tie certain policies to “compassion”, as if the political leanings are on completely opposite ends of that spectrum. Since people aren’t just going to magically go away, those with less will continue to be an externality to everyone else’s economic equations — hidden taxes to society. The uber-rich will of course will be able to avoid it and look the other way, but the costs will catch up with the rest of us, maybe in just crime and the prison-industrial complex alone. So, it’s not a “I / You care more about poor people than you / I do” argument…keep your “conservative” hat on, keep with the spirit of Data Wonk columns and consider the economics — Maybe, just maybe, “socialist” things like Social Security and other programs work out for the betterment of society in the end. And again he doesn’t answer direct questions and puts words in my mouth. You are the worst kind of troll Jason. You also continually get things wrong, but you are post-truth like your hero Trump so you don’t care. Liberals don’t want to raise taxes on working people despite your claim, which you probably know isn’t true but again you don’t care. And California’s economy is strong and thriving. It’s in much better shape than Wisconsin’s. You are a deplorable Jason, which I’m sure you’re proud of. How can we chase you away? We’re better off without people like you. They are talking about this on NPR right now. Experts from across the political spectrum agree that Trump’s methods will not work because he can’t stop or change global trends or economic principles. Obviously companies are most concerned with profits and business decisions that benefit their organization. If they are going to be punished for moving production abroad, they will adjust and move to invest in technology and automate more jobs in the U.S. Carrier and other companies have already said they are doing this or planning to do it. More automation means less jobs. Trump can’t stop that. If a government action does not benefit the common good, it should never be enacted. This standard began with the founding fathers. Neither Trump nor his billionaire appointees believe in the common good. Jason lies in post 1 when he says that people collecting Social Security disability doubled (from 5 million to 10 million) under Obama. The Ayn Rand is an appropriate example. If you don’t believe so explain why. There has been plenty of discussion on the influence her fictional writing has had on gop leadership. If you don’t agree, then explain yourself. On other issues raised, the SS system would be an easy fix. 1. Designate the money collected by SS be spent only on that program. Lets quit siphoning off funds to other programs or loans. 2. Lift the cap on taxes from $118,500. Clearly the bulk of earnings has been made by the wealthy in this country. Time for them to pay taxes on 100% of their earnings like almost everyone else. This helps reverse the trend that most earnings have gone to the wealthy and helps stabilize the program. Anothereasy savings would be to hold the military accountable for the funds they receive. They can’t account for trillions over the last 15 years. Republicans are always quick to say you can’t throw money at a problem, if its Education or a social program, but willingly throw billions of dollars away on the military which can’t keep track of it. Until they can acount for the money they are given, no increases. First the percentage is 12.4% (not 12.5%) and that only applies to poor and middle-class workers, not all workers. Rich people (anybody making over $127,200 in 2017) pay less than 12.4%. For example, if you make $250,000 this year, you (and your employer) only pay a total of 6.31% instead of the normal 12.4%. If every worker, rich and poor alike, actually paid 12.4%, Social Security would be fine. Mike Carey (post 9), you say we should “Designate the money collected by SS be spent only on that program.” That’s already true. Over 99% of Social Security spending goes into benefits; the balance is Social Security’s administrative costs (incurred disproportionately on disability benefits, not for old-age pensions). Yes, that money is spent by the feds, but the alternative is having Washington borrow even more from others (including China). I also point out that, when you buy US Savings Bonds (or a bank CD), your money is immediately spent by others. As long as the Tea Party crazies don’t take over Washington (and default on the US debt), the Social Security trust fund assets are real and collectable when needed. If the Tea Party crazies do take over and default on the debt, then every insurance company and bank will also go belly-up, and FDIC insurance will be worthless (because the FDIC’s reserves are 100% invested in Treasury debt). Thanks, Tom D, for factual information re social security in posts 8 & 10, and for reasonable inferences from facts. If everybody in this country paid 12.4% of their income into social security, that program would be solvent for longer than most of us will live. Had W had his way in 2005 – when he promoted partial privatization of social security, the GREAT RECESSION of 2007-2009 could have decimated the program. Paul Ryan and other fans of Ayn Rand are talking again about social security like W used to … Let’s not let that loser dog anywhere near this hunt.